I'm no McCain fan anymore (who didn't like him in 2000? ), but his wife would probably be a better VP than Palin. True. I think Minnie Mouse could also fall into that category. Was hoping for a light entertaining column. Too bad I was hit in the face with politics when I logged in (too much of that everywhere else). Oh well...maybe I'm wrong and your blog will take you to a governor's mansion someday. Good luck. KA, I checked out your page here after reading about you online on the "waiter/waitress" article. In the article you and others spoke of the "entitlement" attitude that some of your customers have had to you, including rudeness, talking down, and belittling the servers. Your response (very good) to these kinds of customers made me want to look at your web page. So I was surprised that the first thing I saw there was you referring to the first female GOP vice-president candidate as "dumb". That seems to contradict how you were presenting yourself in the "waiter" article. Hopefully you really do not feel that way, but if you think courtesy and class are important then you should consider applying it to all parts of your life. Of course you are free to support who you want for any elected office. But there are better ways to express your views than using the same rude and insulting language that you dislike being subjected to at work. That is just my thought! Keep up thhe positive attitude at work, and keep having fun! Thanks for stopping by, anonymous & Big Mike! I think you were very tactful in how you disagreed with me in your comments and thank you for it! And I will agree, you do have a point about my feelings towards Sarah Palin. I resort to very catty thoughts and commentary when I confront my negative feelings about this GOP candidate, and it's not consistent with my decidedly pro-woman attitude. Something for me to think about, thanks for tactfully bringing it up. Is it true? I wouldn't be surprised. I had a friend who dyed her hair brown when she took a new job, so as to be taken more seriously. Thanks for stopping by! I believe that my first impression about you was correct that you're a good person (catty and all!). That is probably why you have excelled in your service-related jobs. My youngest son (age 26) is a waiter and shares many of the stories that you & your colleagues have related. Thanks for taking my observations in the spirit that I offered them. I think you will go far in your life. I think that mocking a public figure and talking down to someone in the service industry, to their face, are two *extremely* different things. I have to agree with big mike in Ohio. I came across your blog site while I was reading some of the articles written by "The Waiter"(very entertaining and enlightening) and was just wondering what your take might be on the patrons you have to deal with. I was disappointed that the first thing I saw was the Gov. Palin reference. First impressions are lasting impressions. Big Mike pretty much said it all so I'm not going to "beat a dead horse" so to speak. I would like to leave a couple of quotes if you don't mind. Hey, other than that, I enjoyed your site and all but one article. Thanks for "listening"
Sorry you disagree with my stance on Palin, yellarcan, but you should note that this blog was initially conceived as a study of how people treat women based on hair color. 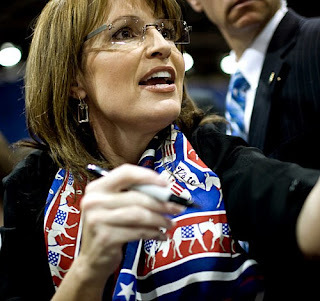 I think the open question of how people would view Palin were she blonde instead of a brunette is a valid one. I'd bet money on the fact that it would be a whole different discussion if she had goldilocks.